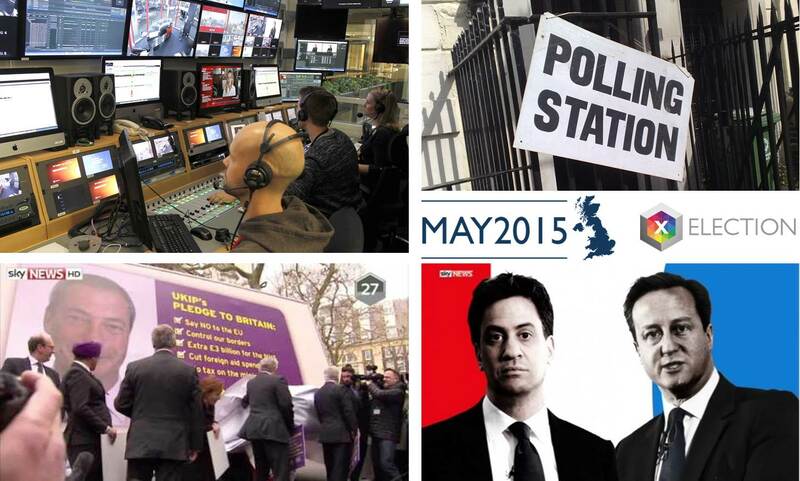 A LiveU solution: On 7th May Sky News will be live from over 270 declarations. The Sky News team will broadcast from key constituencies across the UK including Kay Burley from Witney, David Cameron’s seat, Anna Botting from Sheffield Hallam, Nick Clegg’s constituency, Andrew Wilson from Margate where Nigel Farage will be hoping to gain the Thanet South seat, Jeremy Thompson from Ed Miliband’s constituency in Doncaster, and Eamonn Holmes will be in Sunderland where the first result of the night is expected to be announced. Since 2006 Reckord has specialized in providing services in the field of live television transmissions and recordings as well as services associated supporting TV live productions. In June 2012, Reckord bought the “Přenosy ACE a.s.” and has integrated these new production capacities into the structure of the company Reckord – outside broadcasting s.r.o. Currently Reckord is operating five HD OBVans and two DSNG vans. This transaction will be finalized tomorrow in conjunction with NEP’s acquisition of Mediatec, which was announced earlier this month. With Mediatec, Outside Broadcast and RecordLab now part of NEP, the company offers over 110 high-definition (HD) outside broadcast units; HD flypacks, satellite uplink trucks; smaller camera systems and other audio visual packages; specialty and wireless cameras; postproduction facilities in Dublin, Oslo, Helsinki, Zurich, Munich and Leuven (Rotselaar); studio facilities in Los Angeles, New York, Connecticut, London, Sydney, Melbourne, Oslo, Helsinki and Brussels (Londerzeel); thousands of plasma, LED, and projection video display solutions; a fleet of mobile LED trucks across North America and Europe; as well as an industry-leading team of engineers andtechnical experts. When the 2015 London Marathon kicked off on Sunday 26th April, more than 38,000 participants crossed the starting line, making it the biggest in the event's 35-year history. For the second year in a row, Broadcast RF was there with Vislink equipment to provide continuous live coverage of all 26.2 gruelling miles from Blackheath to The Mall. To ensure top class coverage of every step of the course throughout the day, Broadcast RF and AMP Visual were relied upon by CTV OB (Outside Broadcast) and BBC Sport to provide the wireless live feeds for the event, which was viewed by a global audience of millions across 196 countries. A special version of Robe’s ROBIN LEDWash 800 PureWhite SW fixture was specified by lighting designer and broadcast lighting and visual media effects specialist, Manfred Ollie Olma, from Cologne, Germany based lighting and visual design practice, mo2 design, for the new state-of-the-art Al Jazeera broadcast studio in London. The studio, located on the 16th floor of The Shard in London features 80 of these Robe moving lights. mo2 design was commissioned by set design and constructor Studio Hamburg, Germany’s leading production service centre for film and television, which installed the studio’s set and infrastructure on the strength of their designs for other high profile TV studio installations. These have included Phönixhof in Hamburg (also using Robe lights) and Sky Sports News in Munich. “Let’s start talking!” shouts Julie Chen, host of the CBS show The Talk, as her bubbly cohosts charge onto the set. The live studio audience is on its feet cheering – it feels more like a football game than a one-hour chat session. Their playing field is a multilevel set with a central table, a couch for celebrity guests, a kitchen, a library and an area for musical acts. The audience flanks the set on three sides of a stage that looks much bigger in reality than it does on TV. Despite its snappy title, in the competitive landscape of daytime TV, the talk show is no longer all talk. As the show enters its sixth season, the high-energy format makes each show feel fresh and it keeps the lighting crew sharp. During a one-of-a-kind "digital sticker" initiative created to bring fans worldwide closer to their favorite team, Microsoft® and Real Madrid used the Riedel Communications STX-200 professional Skype® interface to facilitate a real-time Q&A session between Real Madrid fans and players. Licensed by Microsoft, the STX-200 is a stand-alone, broadcast-grade solution that leverages Skype to bring live content from remote participants directly to the on-air production. "The live Q&A session between Real Madrid fans and players during the 'Fan Sticker Album' event is a perfect example of using the power of Skype to create community," said Lars Höhmann, product manager of Skype and MediorNet at Riedel Communications. The Jacksonville Jaguars have installed the first-ever stadium Jumbotron deployment of Virtual 1st, ChyronHego's "down and distance" broadcast graphics solution designed specifically for American football. Virtual 1st provides animated virtual first-down and line-of-scrimmage graphics to enhance the real-time action displayed on the Jaguars' new 8K HD LED video scoreboards, the largest of their kind in the world. Designed as a tool for broadcasters to enhance live football game coverage, Virtual 1st combines video overlay and sensorless camera technology to help presenters quickly analyze game-play and tell an engaging and easy-to-follow story. Broadcasters are able to insert virtual lines of scrimmage, first-down lines, and animated graphics to highlight down and distance, with the ability to customize the graphics to match the network's on-air style. The full host broadcast operation is managed and co-ordinated by Infront’s production team and will include over 20 cameras around the ice rink for every game, including two super-slow-motion-cameras, in-goal and overhead centre-circle cameras. The HDTV signal will be produced by one HD OB van in each arena and distributed worldwide to all broadcasters via fibre and satellite. In addition, Infront will be providing support for broadcasters in their unilateral production, as well as with transmission and commentary facilities together with the provision of live statistics and additional services. Adding visibility in territories where no or no conflicting media rights agreements are in place, Infront will again offer a high quality live video streaming service on the IIHF’s official YouTube channel. This offering will be complemented by highlight clips available across various official IIHF social media platforms. Vodafone Istanbul Half Marathon was held in Old City of Istanbul on 26 April 2015. More than 8 thousand people attended to the Half Marathon. The Half Marathon has been produced by ACTAMEDYA& MEDIAPRO TURKEY and CAMERA TEKNIK co-operation. 1 Helicopter, 1 Cineflex camera, 2 Motocycles, 2 Motocycle cameras, 2 OB Vans, 5 DSNGs, 2 Octocopters and 3G supported broadcast systems were used in the organization that was co-ordinated by an entirely Turkish team. For the broadcast fixed RF points were set up in Eyüp, Feshane, Yenikapi, and Galata Tower. The broadcast signal was flawless thanks to the high level of technical co-ordination. Fort Lauderdale-based lighting and video rental company Paradigm Lighting once again delivered a fabulous production, lighting design and kit for the Live Stage at this year’s Ultra Music Festival in Miami, with Robe Pointes and MMX Spots at its core. Paradigm’s owner and founder Jorge Valdez has been involved in lighting this stage at the US’s premier EDM extravaganza for the last 12 years. The Live stage, located at the 7500 seat outdoor Klipsch Amphitheatre at Bayfront Park, was a major hotspot of the event, and hosted up to eight live artists a day for three days. This year included jaw-dropping sets from Krewella, Netsky, Kygo, Porter Robinson, Bassnectar, Royksopp and Chromeo. Few rental companies have been as progressive as Wigwam in deploying Optocore optical fibre interfaces over the years, and configuring drive racks designed to give their sound engineers a much more ‘fuel efficient’, elegant and secure ride. And when the experienced Dave Bracey, FOH engineer with one of Wigwam’s long term accounts, Björk, wanted a more compact, efficient and tourable FOH package, with no single point of failure in the signal flow for this summer’s festival shows in the US and Europe, he again turned to Wigwam. XL Video once again contributed video production to The X Factor Live 2015 tour - six weeks around UK arenas showcasing the considerable talents of the 2014 X Factor TV series finalists - including popular runner up Fleur East and winner Ben Haenow. XL supplied ROE MC-7T and MC-18T Hybrid LED screens in XL’s custom touring frames, cameras / PPU, Catalyst media server playback, a large Barco Mi-Strip scenic feature, projection and crew for the colourful, animated megamash of 30 major musical numbers, which was performed by 8 artists and 11 dancers to sell out audiences. The live tour show was produced by Beth Honan for Syco Entertainment under the technical direction of Production North. At the EVS press conference at this year's NAB Nicolas Bourdon, SVP Marketing, introduced the newly appointed Managing Director and CEO Muriel De Lathouver to the audience and both were debuting a number of new features on the EVS products for sports and live TV production professionals hungry to enhance their productions via improved replay operations. Topping the list was the introduction of the new Multicam software engine for EVS’ iconic XT3 servers. Customers can expect expanded flexibility with increased SuperMotion camera configurations of up to two SuperMotion six-times camera recording with two additional recording and playout channels available. Other new features include ingest and playout options with the XS server for studios and audio channel/MADI support. All of the production/post production forces (for broadcast, studios) were showing IP components and system that were totally 4K ready. IP is a natural for content producers – cheap, common, reliable and can be used almost everywhere. That makes it fast and easy for studios to add components as needed--even for remote work. None of the attendees were really interested in the public network because it’s too easy to be hacked and hijacked. That’s why people like Harmonic had a very strong private IP solution, but all were at least semi-proprietary. Security was the key selling point everyone offered! Several of the folks were showing Cat-6 and IP network solutions that were easily handling uncompressed 4K video (tons of data moving through the wires), so the options are there. Because production budgets have become so tight, few studios have all of the work done in-house but use specialty shops for rendering, FX (special effects), coloration, audio enhancement, etc.